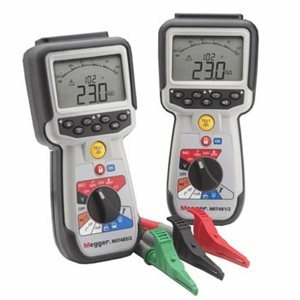 The MIT480 mk2 series insulation and continuity testers replace the original MIT480 range and are designed specifically for the Telecommunications and Cable testing markets. Three terminal measurement design permits the connection of all three test leads for A, B and E (or Tip, Ring and Ground). The measurement pair is selected from the A-B-E (T-R-G) button on the front panel. Selection is confirmed in the display. No disconnection of test leads to measure individual pairs are required. Alternatively the units can be used as a conventional Two Terminal instrument.